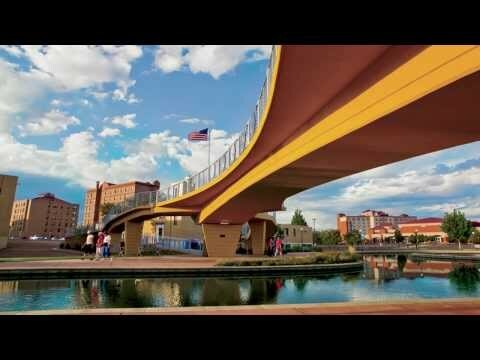 The city of Pueblo, Colorado is a place where your dreams can be as big as the snow-capped mountains, where fleece jackets and tuxedos are equally trendy, where small-town charm meets big-city fusion. Pueblo contains a dynamic mix of arts and culture, shopping and dining, sports and entertainment. Approximately 300 sunny days a year attract outdoor enthusiasts to a full slate of summer and winter recreational activities, encompassing water sports at Lake Pueblo, biking or running along Pueblo's beautiful river trail system, golfing, playing tennis, hiking or skiing in the mountains to the west, or just getting some sun. The nightlife venues feature local and national artists performing at the Sangre De Cristo Arts & Conference Center, dinner theaters, and local nightclubs. Nearby, mountain communities host unique festivals, world-renown ski slopes and abundant recreational adventures. Take in the friendly atmosphere at one of the local coffee cafes, enjoy the rich and spicy dining experience that is making this region popular, or watch a sunset from the shore of Lake Pueblo. We invite you to explore our beautiful city from the shopping malls and 14-screen theater approximately 2 miles from campus, to the Royal Gorge Bridge less than an hour away. We're proud to be a part of such a beautiful and dynamic city, Pueblo Colorado, Home of Heroes (4 Congressional Medal of Honor recipients). For more information about Pueblo, such as real estate listings, things to do, school ratings and detailed information about our population, visit our Livability.com​ webpage. One of the major attractions to Southern Colorado is our ideal year-round climate with four distinct mild seasons, crisp mountain air, and over 300 days of sunshine per year! Southern Colorado also has an uncrowded, low-density population. In addition the scenic beauty is unrivaled with towering pine forests, snowcapped mountains, rock outcroppings, monuments, and plateaus. We also have all the outdoor recreation Colorado is known for including, water sports, boating, fishing, hunting, camping, hiking, skiing, golfing, scenic drives and horseback riding. With our climate and location, you can also whitewater raft, rock climb, mountain bike, gamble in historic towns, take scenic train rides, and even search for dinosaur fossils. All attractions are easily reached from Southern Colorado. Colorado is the highest state and has more mountains reaching 14,000 feet than any other state. Colorado is home to the world's largest flat-top plateau called Grand Mesa. Colorado covers 104,100 square miles, making it the 8th largest of the 50 states. Colorado is a center for vacationers taking advantage of the pleasant summer climate and the ample supplies of powdered snow in the winter. Laying claim to over 300 days of annual sunshine statewide, and more than 300 inches of snow in the mountain resorts on a yearly basis. In fact, it snows somewhere in Colorado every month of the year.